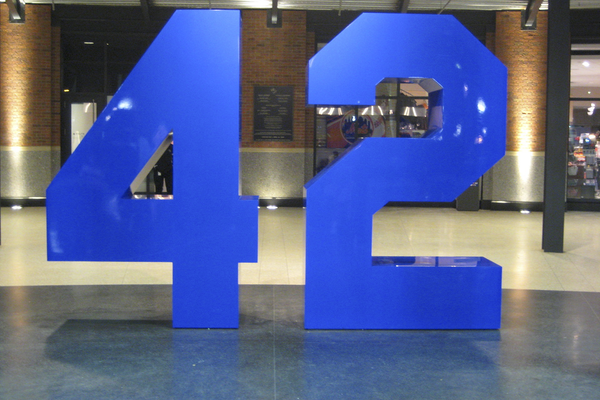 Blogs > Steve Hochstadt > Happy Belated Birthday, Jackie Robinson! January 31 was Jackie Robinson’s 100th birthday. Thinking about him always brings tears to my eyes. Let me try to figure out why. I was born a Brooklyn Dodgers fan. Like most kids, I didn’t have much choice about whom to root for. My parents were Dodgers fans, and so was I. I was born in Manhattan, spent two years in Queens, then moved out to the Long Island suburbs. I never asked them why they didn’t root for the great Yankees or for the Giants. Was it my mother’s choice? She grew up in Queens, a girl athlete before girls were allowed to be athletes. She taught me how to throw a ball, play golf and tennis and ping-pong, and shoot pool. I don’t think she ever was allowed to be on a team, until she became captain of adult women’s tennis teams in California in the 1970s. Did she learn to root for the Da Bums, just a couple of miles away at Ebbets Field, who had not won a World Series since 1890 and sometimes presaged the clownish ineptitude of the early Mets, who inherited many of their fans? She never explained her Dodger love. It might have been my father, who probably had never heard of the Dodgers until he arrived in New York alone at age 18 in 1938, just escaping when the Nazis took over his home in Vienna. He grew up playing soccer and never was able to smoothly throw a baseball. Did my father hear of Jackie’s college exploits when he sold men’s hats in Los Angeles in 1939 and 1940? Jackie led the NCAA in rushing and in punt returns on the undefeated 1939 UCLA football team. He also lettered basketball, baseball, and track, the first athlete to letter in four sports in UCLA history. He won the NCAA championship in the long jump in 1940, and would have gone to the Tokyo Olympics that year if they hadn’t been cancelled due to the outbreak of war. I was born the year after Jackie played his first game for the Dodgers in 1947. By the time I understood anything about baseball, he was already a superstar with a super team: Rookie of the Year in 1947, MVP in 1949, All-Star every year from 1949 to 1954, leading the Dodgers to six World Series in his ten-year career. My brother and I have puzzled over many of our parents’ ideas since they died. But I don’t think that their fondness for the Dodgers was about success. Although they never talked about it, I believe race was at the heart of their preference. I doubt if my father ever met a black person growing up in Vienna. But the Nazis taught him about the evils of white supremacy as he was growing up and later when he returned to Europe with the US Army, interrogating prisoners of war and seeing concentration camps. In our home, Jackie Robinson was a moral hero, as was Branch Rickey, general manager of the Dodgers, for signing him in 1945. We were excited to watch catcher Roy Campanella, who entered the majors in 1948, and pitcher Don Newcombe, who was Rookie of the Year in 1949. When most major league teams were still all white, the Dodgers fielded three black men, all of whom played in the All-Star game in 1949. I must have seen Jackie play in many games on our little black-and-white TV and listened to Vin Scully’s play-by-play on the radio. But Jackie retired when I was 8. I remember him more vividly in connection with Chock full o’ Nuts, that “heavenly coffee”: “better coffee a millionaire’s money can’t buy.” Another enlightened white businessman, William Black, hired Robinson as vice president for personnel right after his baseball career ended. Chock full o’ Nuts was the Starbucks of the mid-20th century, with 80 stores in New York, most of whose staff were black. Robinson’s political activism for civil rights was fully supported by Black. I understood little about the civil rights struggle and was too young for coffee, but I knew about Jackie’s role as business executive. Jackie Robinson was a Republican. He supported Richard Nixon against John F. Kennedy in 1960 and worked for Nelson Rockefeller’s 1964 presidential campaign. My parents were Democrats and I’ve wandered further to the left since then. But partisanship mattered much less in those days than morality, and Jackie came to represent for me the high moral calling of activism for equality, not just in politics, but in life. I was born into a family that assumed that racial discrimination was immoral. It was immoral in Europe against Jews and immoral in America against blacks. When I was young, I didn’t know about Jackie Robinson’s life before the Dodgers or about my father’s life before he left Vienna. I didn’t learn in school about either the Holocaust or segregation. I grew up in an antisemitic and anti-black society in the 1950s and 1960s, but barely realized it until I went to college. Even at an Ivy League university in the late 1960s, lessons about American prejudice and discrimination were not a regular part of the curriculum. Over the past 50 years, life and the study of history have taught me the facts behind my family’s moral certainties. Jackie Robinson has accompanied me along the way, as inspiration, role model, hero. To see 100 photos of Jackie’s life, click HERE. If you’re like me, have a handkerchief ready.